Images of balmy breezes, turquoise waters, white-sand beaches, swaying palms and beautiful islands with protected anchorages popped into my head when in early July, Florida Yacht Charters and Sales offered me the opportunity to deliver a 45-foot catamaran from Miami Beach to Key West, Florida. 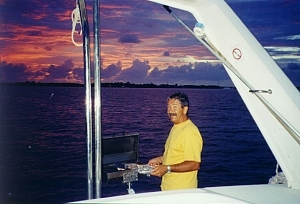 Sandy, my first mate, and I had previously sailed Florida’s west coast, but this trip along 150 miles of islands called the Florida Keys sounded like a trip in Paradise. We invited our friends Barry and Joan, who also live in Canada, to join us. This trip would make their 25th anniversary even more memorable. Prior to our cruise, I emailed several Port Captains in the U.S. Power Squadrons. They graciously provided information about places to visit based on their years of boating the Keys. Anyone planning a cruise in the states would be well advised to make use of this service … we found their suggestions very helpful. One fellow has even developed a Website (see Info. below) that provides lots of information on the Keys. Following a flight from Toronto to Miami, we boarded Wind Chaser at Miami Beach Marina. My first thought when seeing this huge yacht reclining in two slips: “I always wanted to sail an apartment!” Its’ 25-foot beam allows for a spacious galley and saloon, as well as four separate staterooms, each with an ensuite head. Luxury touches include a generator, freezer, air conditioner and chartplotter. As a mono-hull sailor, I needed a practice session in the harbour to get over the intimidation factor of two sets of controls at the helm. What seemed challenging at first became very user friendly. Put one engine in forward, the other in reverse, and let it happen — a pivoting turn around the centre of the boat … great for close-quarters’ maneuvering. During our 7-day trip, we discovered other reasons cats are so popular among cruising sailors. Our speed was noticeably faster: we often achieved 8 knots in moderate winds. We never heeled over, which means more relaxed sailing, no spilled drinks, and no vertiginous aftereffects on land. The shallow 4.5 foot draft allowed us to get close to those pristine beaches. And the bow trampoline was a great place to relax and savour the occasional spray of cool water. The evening of our arrival, we enjoyed a splendid dinner on the patio of nearby Smith & Wollensky Steak & Chop House, overlooking the boating scene at the entrance to Miami Harbor. We then visited wild and wacky “SoBe” (South Beach), gawking at the locals like a bunch of tourists. They say you can get anything you want in this trendy art deco district of Miami Beach. All we wanted was pistachio ice cream and Cuban coffees — no problemo! The next morning, we shopped for groceries and received a chart orientation from Bob, manager of Florida Yacht Charters’ Miami Beach base. Departing at 1400, we motored south into Biscayne Bay through “Stiltsville,” so called because the houses are built on stilts in tidal flats just outside the channel. In the tranquil waters of the Bay, we sailed for a couple of hours to our destination of Boca Chita Key. When we arrived, it was too late to explore this picturesque island with its prominent old lighthouse. Instead, we anchored in the lee, barbecued some cheeseburgers, listened to Jimmy Buffett tunes and watched a crimson sky fade to dusk. It was starting to feel like Paradise! 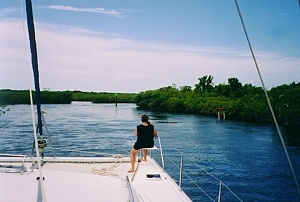 Cruising boaters have three possible routes for transiting the Keys: the Intracoastal Waterway in Biscayne Bay, Hawk Channel outside the islands, or the Gulf Stream outside the reefs. Boaters heading north who want to pick up a 3-knot boost from the current prefer the Gulf Stream route. Since many of the prime snorkeling reefs are in Hawk Channel, we chose the middle route, which is not as rough as the ocean or as calm as the bay. Four-foot seas in the ocean are reduced to two feet by the off-lying reefs in Hawk Channel, and to a ripple in the more protected bay. As it turned out, the weather was picture perfect during our week with steady winds of 10 to 15 knots and comfortable seas. We exited the bay through Angelfish Creek, a narrow waterway leading to Hawk Channel. A short distance out is Carysfort Reef, one of a dozen or so snorkeling reefs designated a National Marine Sanctuary. We tied to a mooring buoy and stepped off our boat into a virtual aquarium. Brightly coloured fish swam calmly in front of our masks. Visibility was excellent, clear enough to see a barracuda and shark observing us 30 feet away … we all lunged for the swim ladder! Later in the week, we began to appreciate that we’re not considered “bait” to these predatory denizens of the deep — just sea creatures with big feet and big eyes! After lunch we sailed to Largo Sound with its’ interesting entrance — a mile of twisting, narrow channel through mangrove trees, providing a refuge for egrets, bald eagles, ospreys and other birds. After entering the Sound and tying off to a ball, we dinghied through Cross Key Canal to the Key Largo Bay Marriott Beach Resort. Here we enjoyed a very memorable dinner — yellowtail snapper, almond crusted with mango salsa … sure beats cheeseburgers! The next day, 15-knot easterlies made it too rough for snorkeling but perfect for topping 9 knots on our 20-mile sail to Indian Key. We tied to a ball and explored this now-deserted island. In 1840 a thriving settlement was attacked and burned to the ground by marauding Indians. Only foundations and signage provide a glimpse of how residents once lived on this small parcel of land. On a balmy Forth of July evening, we watched six different fireworks displays along the shoreline. And Mother Nature, not to be outdone, was serving up her own display — a localized lightening storm just offshore that made the others look like sparklers. Such disturbances are common during warm summer evenings in the Keys but they generally pass quickly. At this point, we were halfway down the Keys and halfway through our charter, averaging a comfortable 22 miles a day. On our next day’s sail to Long Key, we were hailed by several teenagers in a skiboat that had run out of gas close to our anchorage in Long Key Bight. We provided a jerry can of gas to get them to a nearby fuel dock. They renewed our faith in teenagers by returning the jerry can full of gas. Our destination the next day was Boot Key Harbor on Vaca Key. This popular anchorage is located at the eastern edge of seven-mile bridge, one of 42 that link the islands via U.S. Route 1. Our mast height prevented us from passing beneath a bridge at the entrance to the Harbor so we docked at Marathon Marina just outside. For dinner, we taxied to The Island Tiki Bar & Restaurant, which provided good grub in a casual waterfront setting. Back at the Marina, we watched a large manatee lazily surfacing off our stern. A declining number of these gentle creatures live in the rivers and coastal areas of Florida. Conservation efforts, such as posted speed restrictions in manatee areas, will hopefully lead to their continued survival. From Marathon, we motor-sailed in light winds to Newfound Harbor where the movie PT 109 was filmed. Keeping our eyes open for torpedo boats, we traversed the 2-mile channel to our anchorage in the lee of Big Pine Key. Just before sunset the wind picked up prompting us to put out a second anchor. We also pressed the man overboard button on our chartplotter, which then shows any change in feet and direction from our anchored position. After ensuring we were not dragging, we retired for a peaceful night’s sleep with wind whistling through rigging. By morning the winds subsided allowing for one final snorkel at Looe Key, a popular dive site with 54 mooring buoys. As we departed on the final leg of our trip, a bat ray flipped out of the water next to us, waving its wings as if to say “goodbye.” Two dolphins, one off each bow, escorted us part way to Key West. We docked at Florida Yacht Charter’s base in Conch Harbor near downtown Key West. A final sleep aboard allowed us the opportunity to explore this vibrant city before renting a car for our return drive to Miami International Airport. If you want to visit paradise, try the Keys on a cat. It’s purr-fect!